Coffee is already a culture in Chicago, and neighborhoods across the city have become fertile ground for small-batch roasters and independent coffee shops with atmosphere. 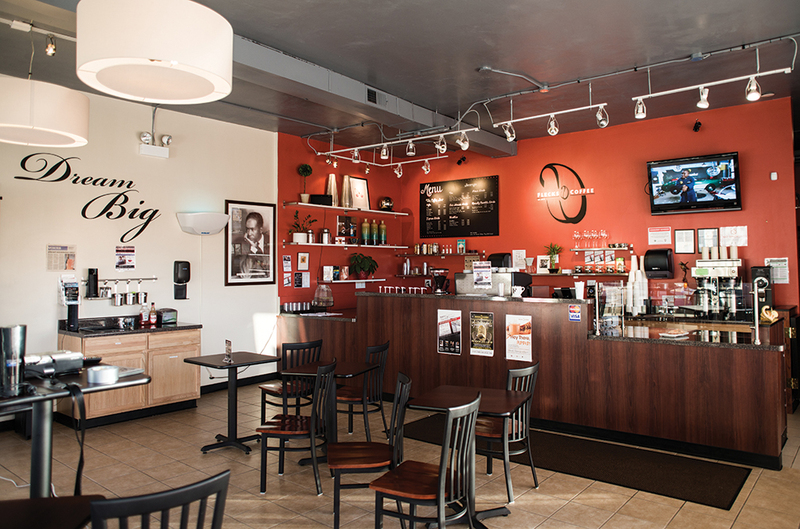 Hyde Park has more than a full serving of cafés catering to the UofC population, and nearby Woodlawn has Robust Coffee Lounge, home to the Mocha Diablo. Flecks Coffee, however, is the first shop of its kind in Chatham, at least according to its owner and its patrons. The shop is minimalist in design but elegant. It’s furnished with wooden tables and high chairs, and brightly lit from two walls of windows facing out onto the street. Customers drop in for a cup of coffee and stay to watch highlights on the flat screen behind the counter and talk football with the barista. Lines of glasses stand along the large wooden counter, in front of a gleaming new espresso machine and the Flecks Coffee logo on the wall. The name comes from the blond flecks in the crema on top of a quality cup of espresso, according to Zuli Turner, the younger half of the mother-daughter ownership team, along with her mother Olga. Instead, the menu includes specialty Belgian waffles and omelettes for breakfast, paninis and salads for lunch, and of course, plenty of coffee drinks. The food is made to order in the shop, with fresh fruit as a side. The Turners aim to build a unique niche in the neighborhood. “One of our missions is to enrich the community, not to take out withdrawals and make no deposits,” said Zuli. While Flecks Coffee has been open for only five months, the shop is already developing into a community hub. This past month (through November 23), the owners hosted a popular Saturday night Noir Film Festival, setting up a projector and a screen along one wall and recruiting help from local filmmakers. In addition to creative types, the café attracts an eclectic crowd of mostly older residents, according to barista Wilton Jones. “It’s something different. People may go to Starbucks, but they might never have had a cappuccino before.” Schoolteachers from the nearby elementary school, CTA bus drivers, retired civil workers, and neighborhood business owners number among the usual patrons.